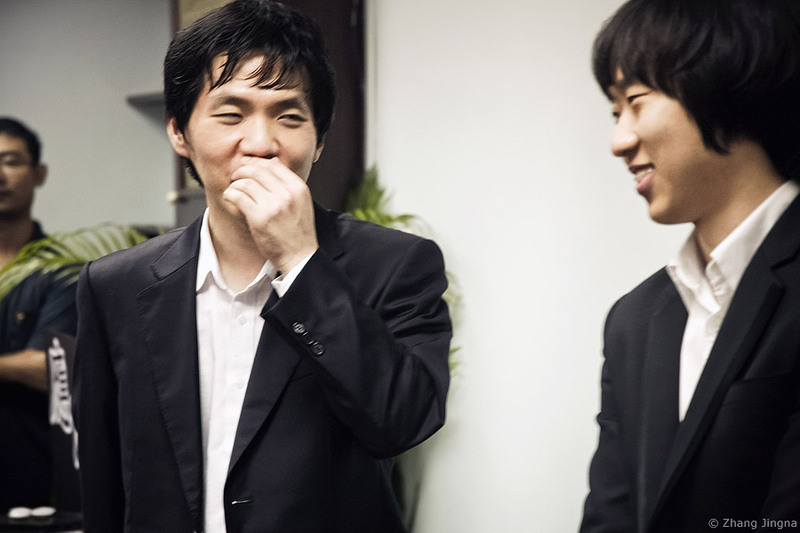 Choi Cheol Han vs Lee Changho 2-1 after Game 3. The last 2 games will be held in Taiwan towards the mid-year. Lee Changho during post-game review. ...with super many Korean reporters. After reviewing and interviews they went out to the main room and met up with fans. The place was so overcrowded the glass panels were condensing and the room felt like a freaking sauna. And I'm like, so not exaggerating. Anyway, something super hilarious happened. What happened was, the team leader of Korean team offered the fans to ask questions, "...anything really. Maybe not go-related? You could ask if Choi Cheol Han has a girlfriend, things like that. Haha." Lee Changho smiled and answered, "I haven't considered marriage yet." And unable to contain his happiness, LCH attempted holding in a shy laugh while continuing, "but I am currently in love." The team leader had translated all that and added to double check if we all already knew that. =_= Like, duh, it was frontpage on every weiqi news website for days. Okay, go laugh at my horrible storytelling. Choi Cheol Han signing a goban, and Lee Changho a fan. Goban signed by Lee Changho and Choi Cheol Han. Lee Changho eventually left for the hotel first. Choi Cheol Han stayed behind to sign more stuff and take photos with eager fans. Some people nudged me to take one with him too, but I didn't want, insisting I'd already had one from Bangkok, despite the fact that it's blur like hell. But after gazillion people were done, Choi Cheol Han still stood at the same spot, so I figured 闲着也是闲着, and took a pic with him at some point. And I wonder why oh why is every single pic of me with a go player out of focus. Oh well. That concludes whatever I think I can post from the competition. It's been fun. And in case you're wondering where you can play go online, KGS is a good and popular one.